Humanitarian concerns "dressing up" the military conquest of Syria. November 28, 2011 - Wall Street and London's media machine eagerly churned out headlines like BBC's "Syria security forces 'commit crimes against humanity'" announcing the conclusions of a recent UN Human Rights Council report regarding the ongoing violence in Syria. However, even upon reading the BBC article it is soon discovered that, "the investigation team members say they were denied entry into Syria itself," and that the entirety of their "evidence" is garnered solely from interviews with "223 victims, witnesses and also army defectors to investigate alleged human rights violations." BBC's article raises immediate suspicion over the veracity of the report, as "victims, witnesses, and defectors," interviewed outside of Syria is not evidence, but rather more hearsay by groups of people with a vested interest in painting the Syrian government in the worst light possible. However, upon actually reading the full text of the UN Human Rights Council report, we see just exactly "how" the report was compiled. Under a section titled, "Methods of Work" we find a shocking admission of the utter lack of substance and immense conflict of interest behind the UN's predetermined conclusion, that Syria is guilty of "crimes against humanity" and that the UN Security Council must act. "First-hand information was collected through interviews with victims and witnesses of events in the Syrian Arab Republic. The interviewing process began in Geneva on 26 September 2011. Overall, 223 victims and/or witnesses, including personnel who defected from the military and the security forces, were interviewed. A public call was made to all interested persons and organizations to submit relevant information and documentation that would help the commission implement its mandate. It held meetings with Member States from all regional groups, regional organizations, including the League of Arab States and the Organization of Islamic Cooperation, non-governmental organizations, human rights defenders, journalists and experts. Reports, scholarly analyses and media accounts, as well as audio and visual material, were also duly considered. The information collected is stored in a secure database governed by United Nations rules on confidentiality." Quite obviously this is not an investigation, nor is the information provided within the report "evidence" by any stretch of the imagination. The report would go on to admit that it received no cooperation from the Syrian government meaning that this publication by the UN is but a one-sided exercise to provide the worst possible image of the Syrian government as told by opposition groups now on record fully armed, foreign-backed, and trying to seize power by force. The inclusion of "non-governmental organizations" (NGOs) should also raise immediate concerns. While the report is entirely negligent in listing any of these contributing NGOs, it is more than likely they include the US government and corporate-funded army of sedition emanating out of the National Endowment for Democracy, Geroge Soros' Open Society Institute, and their myriad of subsidiaries. It has been these very NGOs supplying a steady stream of similarly baseless "witness accounts" since the unrest began earlier this year, as they've done in Libya, Belarus, Tunisia, Thailand, and beyond. "Alleged" is used throughout the report in various forms further illustrating the tenuous nature of the UN Human Rights Council's "evidence" while all of the testimony, those who gave it, and apparently the NGOs involved in compiling the UN report are conveniently kept "confidential." This may be because the United Nations believes that its reputation coupled with global faith in its work is all that is necessary to lend their report the legitimacy it needs to bring Syria one step closer to NATO inflicted genocide. However, considering Iraq and more recently Libya, and the UN's complicit role in facilitating genocide in both nations based on similarly tenuous "human rights" reports, a clear pattern emerges. Human rights activists, their Wall Street and London-funded NGOs, and the disingenuous UN are merely dressing up with humanitarian concerns an otherwise naked campaign of military conquest. Video: Part 1 & 2 of "Lies behind the "Humanitarian War" in Libya." The outrageous, confirmed, confessed "humanitarian-based" lies used with UN complicity to justify NATO's invasion by proxy of Libya. Libya is now run by a corporate-backed proxy Abdurrahim el-Keib, formally of the British Petroleum (BP), Shell, France's Total, Japan Oil Development Company, and Abu Dhabi National Oil Company-sponsored Petroleum Institute. 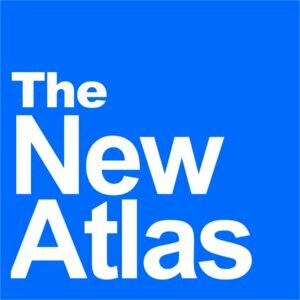 It has been pointed out in April's "Globalists Coming Full Circle," and more recently in Salon's "Wes Clark and the neocon dream" that the unrest unhinging the Middle East, North Africa, and slowly creeping toward Moscow and Beijing, is part of a plan 20 years in the making. Those behind it just so happen to populate the boards of the faux-humanitarian front, National Endowment for Democracy (NED), have affiliations with the so-called "liberal" George Soros and his Open Society Institute, and have signed their names to Hitlerian declarations of world conquest within the notorious "Project for a New American Century." You're not expected to read the report, let alone research the authors. Without a doubt, the UN has compiled a tenuous and transparent fabrication of such little substance, those involved in writing it, Paulo Pinheiro, Yakin Ertürk, and Karen Koning AbuZayd, are clearly conspiring to justify an otherwise unjustifiable escalation in Syria's current unrest. If they did indeed have evidence of Syrian brutality, they surely would have included it in their report and the voices at the BBC, on CNN, in Reuters and beyond would ceaselessly air it. Instead, the impact of the report solely depends on people trusting the legitimacy of the UN and not bothering to even objectively read it. It equally depends on members of the media, including the disingenuous hand-wringing "humanitarians" amongst NED's vast global network to keep their heads down and not expose this willful duplicity. The impact of the UN's report also depends on people not bothering to research the associations of those who compiled it. Should they, they will find that Karen Koning AbuZayd is concurrently a member of the Washington D.C. based Middle East Policy Council, along side current and former associates of Exxon, the US military, the CIA, the Saudi Binladin Group, the US-Qatari Business Council and both former and current members of the US government. It is more than just a coincidence that the UN Human Rights Council report has given the US exactly what it wanted to hear regarding Syria, and one of those compiling the report just so happens to sit amongst an organization full of corporate-financier interests clamoring to despoil the Middle Eastern republic. Clearly, claims that the UN is merely a tool of corporate fascists on Wall Street and within the City of London represent a truth that confronts anyone who researches any of the claims coming out of the UN. 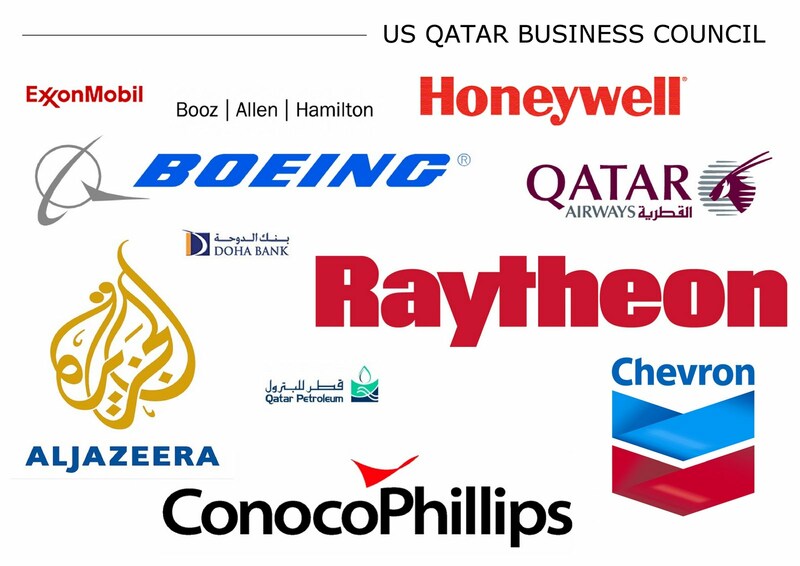 Image: Just some of the corporate members of the US-Qatar Business Council, whose president just so happens to sit on the same board of directors of the Middle East Policy Center as Karen AbuZayd, co-author of the conveniently timed UN Human Rights Council report on Syria. Indeed with this tissue of lies and the associations of the liars peddling them, the UN is truly a disingenuous tool of the world's elite, used to strip the freedom and humanity of its enemies while simultaneously claiming to uphold such values in the process. The Syrian people are facing a criminal conspiracy of vast proportions in a world increasingly devoid of empathy, intelligence, or courage. Like the Libyans who fought for the better part of a year against the militant aggression of global corporate fascism, the Syrians will soon be fighting too. For those indeed repulsed by what has transpired in Libya and what is facing Syria at the hands of the global elite, it should be obvious that the corporations, banks, and institutions involved need to be exposed, boycotted, and promptly replaced. 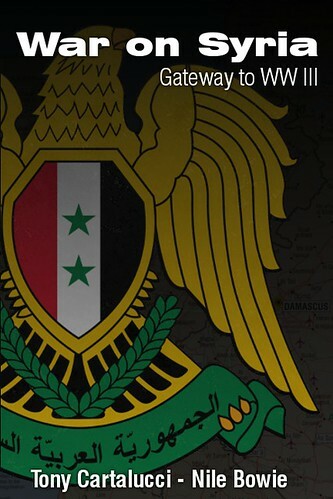 It was Libya yesterday, Syria today, and inevitably you tomorrow. Collectively after World War II we said, "never again," regarding fascism and the rise of Adolf Hitler's Germany, yet here we are.... again.